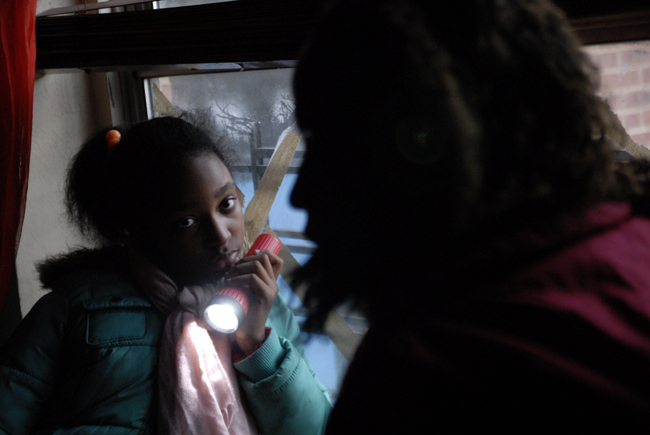 Diavion Benn, a quiet and shy 12-year-old, lives in the Red Hook projects, about 1.5 miles from Carroll Gardens. She and her mom watched the flood waters rush down the streets of Red Hook on Monday, carrying cars, and they were scared. At about 7 p.m., the lights went out. Sunday, six days later, Diavion’s apartment still has no power, no heat, and it’s getting cold. The apartment does have running water. Diavion and her mom have been getting supplies and food at the Red Hook Initiative non-profit on Hicks Street. Red Hook needs our help. 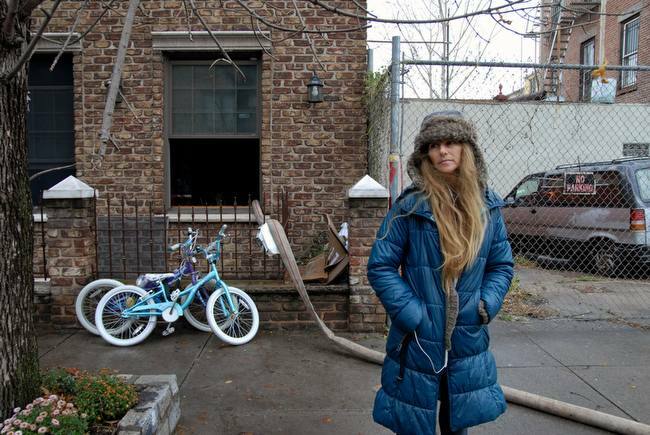 In the Red Hook Houses alone, thousands of low-income families are without power, heat and hot water. Many elderly and disabled people live in the high rises, and without elevators, they can’t get around. So many families and artists lost everything. It’s a bad situation. Con Edison says the power could remain off until Nov. 11, which will leave people in the dark for nearly two weeks. That’s frightening. The good news is, volunteers and donations from the Carroll Gardens area and across the city, literally, have flooded in. Hundreds of volunteers every day have converged on the waterfront area to help. The Red Hook Initiative — at Hicks and West 9th Street, just under the BQE — is spearheading the relief effort. They are asking for volunteers and specific donations, including hot meals. This Red Hook mom worked all day Tuesday to pump out her flooded basement. As of Sunday, volunteers were being asked to report to 402 Van Brunt Street, while hot meals are asked to be delivered to 767 Hicks Street. If you plan to bring a meal, send an email to food@rhicenter.org. Specific needs include cleaning supplies, water pumps and generators, canned food, flashlights and candles, which should be delivered to Good Shepherd Services at 173 Conover Street, or Visitation of the Blessed Virgin Mary, 98 Richards Street and Verona Street. PS 58 Elementary, at Smith and Carroll Streets, got the word out last week that a teacher at the school, Chris Cox, lost his home in the storm. Cox’s family needs help with the cleanup, with meals, they need packing supplies, duct tape, packing tape, sharpies and more. If you’d like to help, contact Jackie Gill, the school’s PTA VP for Community Affairs, vp-community@ps58pta.org and Rose Halligan, 5th grade representative, rhalligan@sterntannenbaum.com. Another family is in desperate need of a headlamp flashlight and wading pants. Contact PS 58 parent Sisi Keghida if you can help, at sk@skesq.com. The Office of Emergency Management has set up an office in Red Hook at 402 Van Brunt Street. They are helping with the clean-up. 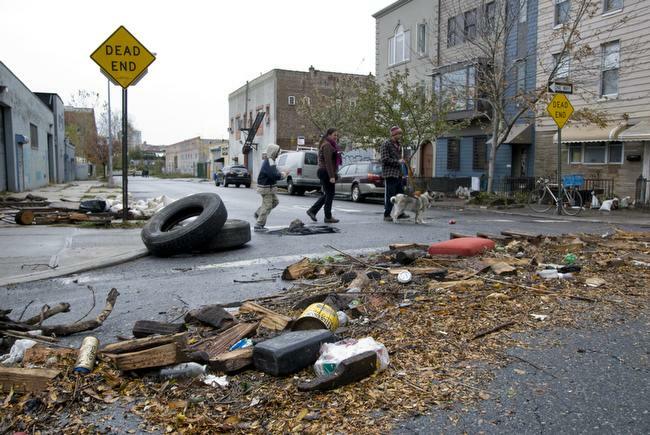 Call the Red Hook Initiative if you can volunteer this week, at 718-858-6782.